The Trinity Universal Health Insurance Company is a subsidiary of the Kemper Corporation. Due to recent legal actions, the Trinity Universal Health Insurance Company no longer exists. Another subsidiary of the Kemper Corporation, the Reserve National Health Insurance Company will be reviewed in its place. The Reserve National Health Insurance Company offers health plans for senior citizens and supplementary health insurance policies. Enter your zip code to see your personalized health insurance rates now! The Kemper Corporation was renamed just a few years ago. Originally known as Unitrin Inc., the Kemper Corporation was started in 1990. Reserve National Health Insurance Company was officially bought out by the Kemper Corporation in the late 1990s, but this company has been around since the 1950s. Customer service can be reached over the phone at 1-800-654-9106. Potential customers can also contact the Reserve National Health Insurance Company by visiting the company website and filling out the online form. These insurance products have been developed to help patients reduce their medical expenses so that they can better focus on getting the care that they need. Although not available to citizens living in all US states, Ohio residents that have federally funded insurance can get coverage through the Reserve National Health Insurance Company. Supplementary vision and dental policies are also sold by the Reserve National Health Insurance Company. Accident coverage and life insurance is available. Currently, the Reserve National Health Insurance Company mainly hires independent insurance agents. It is not clear, if the Reserve National Health Insurance Company prefers to work with experienced agents, or if the company is open to hiring newcomers. While benefits packages are not available to independent contractors, the Reserve National Health Insurance Company does offer other incentives. Top performing insurance agents are rewarded with cash, trips and other performance based prizes. Insurance agents working with the Reserve National Health Insurance Company are given access to prospective clients and are expected to close a certain percentage of sales in order to keep their contracts. The Reserve National Health Insurance Company currently has an A+ rating with A.M. Best. The Better Business Bureau has recorded 12 complaints associated with the Reserve National Health Insurance Company since 2008. Because no consumer-based complaints about the Reserve National Health Insurance Company were found online, it is assumed that customers are largely happy with the services that they receive. Most independent insurance agents report receiving ongoing support, training, and help whenever needed. 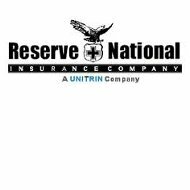 Compared to other insurance companies, the Reserve National Health Insurance Company seems to maintain a good balance between satisfying its customers and its insurance agents fairly well. As there are several ways to get in contact with the Reserve National Health Insurance Company, customer service agents are easy to get in contact with. Existing clients may log onto the Reserve National Health Insurance Company website in order to make payments and access the details of their policies. Customers that have concerns may also call or write to the Reserve National Health Insurance Company and can expect to receive a timely response that addresses all of their issues. The names of the top executives at the Reserve National Health Insurance Company are prominently posted all over the Internet. Insurance claims can be submitted over the web, faxed, or mailed. New policyholders receive information packets as well as their insurance cards through the mail within ten business days. Customers that need to find a health care provider can locate participating physicians on the official Reserve National Health Insurance Company website. All information found indicates that the customer service at the Reserve National Health Insurance Company is at or above the industry standard. Choose a new online health insurance plan once you submit your zip code to see quotes from health insurance providers.